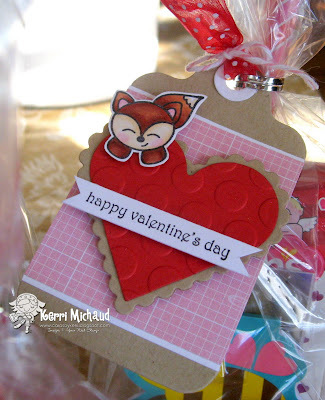 Your Next Stamp Fun Friday Post~Valentine Tags! Hello! I'm so sorry I'm running late with my post! This is the project I have on the Your Next Stamp Blog today:) Valentine's Day is coming up, and that means treat bags for the class! My daughter helped me pick out some fun things she would like to give out to her class, and I wanted to jazz up the presentation a little bit with a handmade tag! I just love that handmade tags make your gift look unique and special! For my tags I used these adorable critters from Jenny Suchin Designs called Basket Animals. Don't they look so cute peeking over the heart?! The tags were cut with the PTI Tag Sale #1 Die, and I used Heart Nestabilities to cut the hearts. I added some Echo Park Paper Co. Yours Truly dp and a sentiment from the SU set Teeny Tiny Wishes. A little ribbon and baker's twine and they were complete! I embossed the hearts with the CB Seeing Spots Embossing Folder. Well I hope this inspires you to create some tags! My daughter just LOVES how these came out and can't wait to give them to her class:) Thank you so much for stopping by and I hope you have a wonderful weekend! I just have to say GO 49ers!!!!!!!!!!!!!!!!!!!!!!!!!!!!!!!!!!!!!!!!!!!!!!!!!!!!!!!!!!!!!!!!!!! These are adorable! What a great idea to add the animals to the hearts. These tags and goodie bags are so SWEET! Love how you've used these sweet animals with the big hearts!!! You are the tag QUEEN!!! You're daughters friends will LOVE these!!! Have a great weekend! These are way too cute! Love these little critters! Oh my gosh...these are adorable! They just automatically make me smile, and you have motivated me to start thinking about Valentine's day goodies. Thank you! 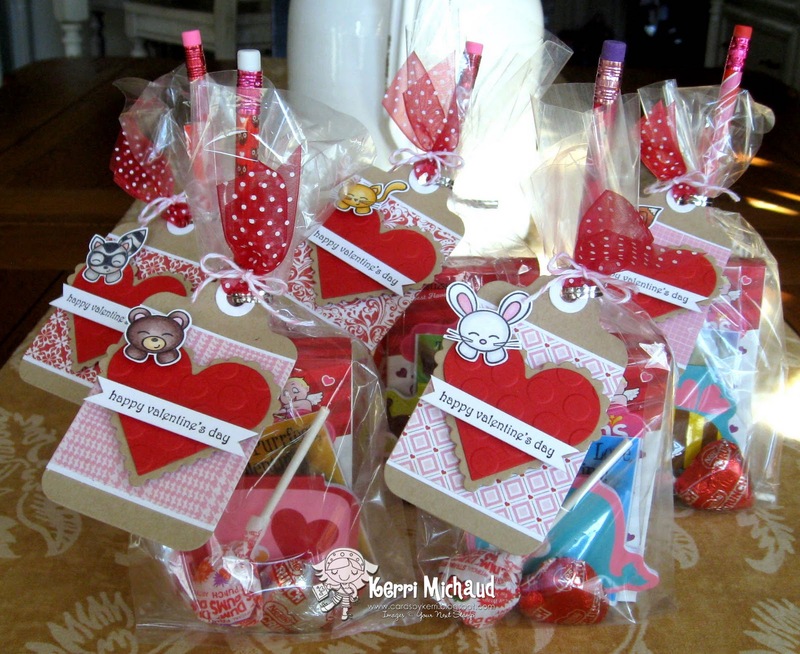 These are super cute treat bags. I love that you made them for her.